With my last exam casting a shadow of doom across me for the next week, my mind (in the many moments of procrastination) starts to think ahead to my new found freedom at weekends and what to make next. I lose Tim to the football approximately every 2 weeks when he heads to west brom for the day, leaving me to make as much fabric based mess as I want before he returns. Now is the time to start thinking ahead to presents. Whilst I have started some of my bigger projects already (although naturally cannot say what in case of prying eyes), I can share some of my favourite smaller projects which have made wonderful gifts. 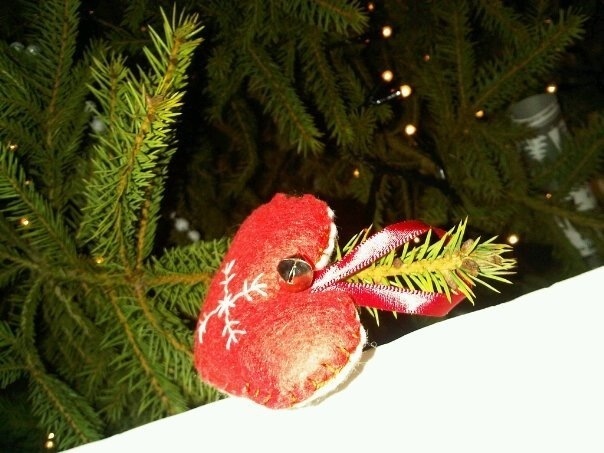 The below is 2 pieces of felt, with a hand stitched snowflake, stuffed then blanket stitched together. I made a few of these the other year only to find they were in such demand that I was up til 2am some mornings making some ready for whatever gathering we were going to the next day! They took no more than an hour and the little bell added a nice decorative touch! Thank you to Holly for for the photo! 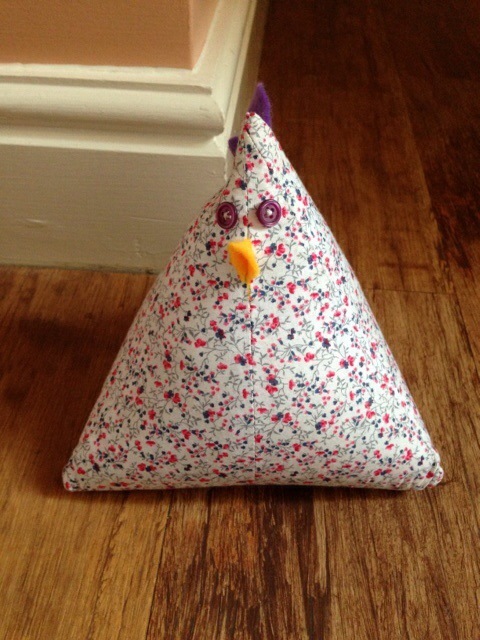 The next is a chicken doorstop that I made for Tim’s mum last year. This I finished in just a few hours. I took this idea from the internet and adapted the pattern slightly. I’m afraid I can’t find the exact site I used to give due credit, but if you’re interested in making one then either google it or let me know and I can sketch a rough pattern. It’s filled with rice to make it heavy and stay put! Where do I get my ideas? I spend a lot of time looking up gifts on the internet then I try and work out how to make them myself! Same as seeing a ready meal in a supermarket but instead of buying it, going home and cooking the same meal yourself from a recipe or your own previous knowledge of how to construct a dish!